Ideal for those looking to host an event or entertain while in town. 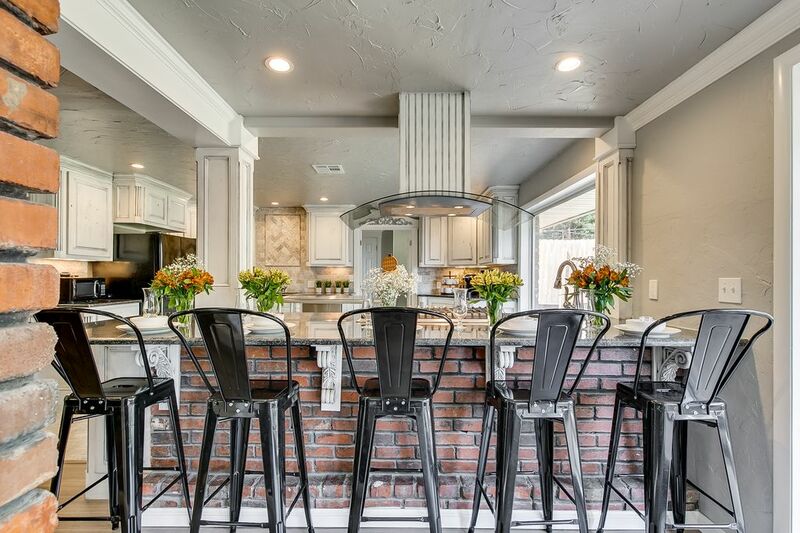 This beautiful home has been remodeled from the studs out to be the perfect home for families and friends to gather and celebrate lifes most important events. It is fully furnished, just waiting in the updated photos! The backyard space includes a fire pit, seating for you entire party as well as 2 fire tables located on the patio that open up from the dining/kitchen area. This home is located directly off of Nw Expressway, making anywhere you may need to travel in OKC a super quick trip. This Beauty boast ample space to entertain. There is ample seating areas in the living/dining areas making it the perfect place for those looking to host get together a, family reunions, baby showers, bridal showers or just have a large group that is looking to hang out and catch up while in OKC. The kitchen is fully stocked and ready for just about any meal you need to prepare. We also have. Kuerig and stock basic K-cups, those who have a special requests are welcome to bring their own. We are located just off NW Expressway. Most anything you could need or want is just a few quick minutes from the house. Edit Profile Welcome to OKC! My husband Casey and I moved here in 2011 and have quickly fallen in love with Oklahoma City's Historic Core. We spend our days renovating homes and our evening hosting those that are traveling to OKC. We love what we do, especially for the opportunity to meet and host new people and introduce them to our rapidly expanding city. This area offers a little something for everyone. From unique dining experiences to boutique shopping, you are covered. We can not wait to meet you and help you enjoy your stay here in our hometown! This property was purchased and renovated for the sole purpose of serving as a vacation rental for those traveling to OKC and needing a place to stay and Entertain. Great place for family gatherings! We loved this house! It was perfect for large family gatherings! Thankful for this amazing space ! This was the perfect house for our family from out of town to come together during the Thanksgiving Holiday. It is very conveniently located, easy to get to with plenty of parking, especially because its at the end of a cul-de-sac. The home has been completely renovated with such care and great taste. The beds in two of the main bedrooms were extremely comfortable ( front bedroom and rear bedroom). The garage has been converted for sleeping space with two air mattresses which worked perfectly for the children in our party. The only down side was it got very cool at night since it is not insulated, but the kids used extra blankets & were just fine. There are multiple seating areas in the living space, which worked very well for family that we visited with throughout the weekend. My communication with the owner was always very prompt when we had questions regarding operating the TV and locating the information for the Wifi. The decor is very warm and inviting. The open floor plan & all of the natural light make the home feel that much more spacious. The kitchen and pantry really exceeded our expectations. There were so many dishes, equipment & utensils to use when preparing our meals which was very convenient & so appreciated. There is even a standing freezer in the garage/sleeping area. The outdoor space is just a really nice touch. Huge back yard with several comfortable places to sit outside, with fire pits & fire tables that provided needed warmth on the cooler nights. This truly is a home for entertaining and enjoyment. We would definitely recommend this place and would stay here again for sure. We had a wonderful Thanksgiving in this beautiful home.